Sunglasses are definitively much needed accessories. I can’t imagine not wearing any, can you? Sunglasses or shades are a form of protective eyewear designed primarily to prevent bright sunlight and high-energy visible light from damaging or discomforting our eyes. 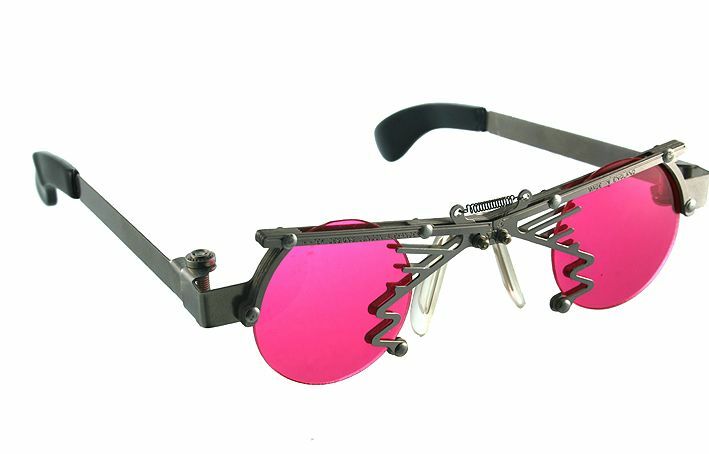 They can sometimes also function as a visual aid, mine are bifocal sunglasses. Guess when the first pair of glasses were worn? Nope, nope and nope – the first sun blockers were made during prehistoric ages by Inuit peoples who wore flattened walrus ivory glasses, looking through narrow slits to block harmful reflected rays of the Sun. Interesting, isn’t it? The Roman emperor Nero liked to watch gladiator fights with emeralds, not a $25 pair of shades! Men Sunglasses made from flat pieces of smoky quartz, which offered no correction but did protect the eyes from glare and reflection, were used in China in the 12th century or possibly earlier. Men only? It seems that women sunglasses were not fashion in those days! Much later around 1752 the British James Ayscough started to thinker with tinted glass not to protect against the sun but to cure or help with ailment. The yellow / amber / brown tint was prescribed to cure syphilis! What is the color of your Ray Ban pair of glasses Sorry to hear that, just kidding you. Starting In 1913, things go very fast when it comes to sunglasses. Crookes lenses were developed and made from glass containing cerium an UV light blocker. In the 1920s movie stars wore pair of glasses for fashion, not function. Men sunglasses and Women sunglasses were small, round handmade of tortoiseshell or metal. Color tint ranged from dark grey to amber. Deep green shades came in the 1930s. The public caught on to the convenience of shades, but the cost was extremely high, up to $25 a pair! That’s about $316 in 2019 – how much did you pay for your Tom Ford Sunglasses? Fortunately, the 1930s, inexpensive mass-produced celluloid pair of glasses made were produced by Sam Foster in 1929. Atlantic City beaches, NJ was where Sam began selling shades under the name Foster Grant. In 1938 it is estimated that 20 million sunglasses were sold in the US but only about 25% of American wore them to protect from the sun – Fashion, Fashion. Today, Xiamen, China, is the world's largest producer of sunglasses, exporting 120 million pairs each year! Don’t dream, your Oakley Sunglasses are made in Xiamen. Our eyes need protection against excessive exposure to light, including visible and invisible components like UV (ultraviolet). UV can cause short-term and long-term ocular problems such as photokeratitis, snow blindness, cataracts, pterygium, and various forms of eye cancer. Medical experts advise us on the importance of wearing sunglasses to protect the eyes from UV. Experts advise the use of sunglasses that reflect or filter out 99% or more of UVA and UVB light, with wavelengths up to 400 nm. A pair of Sunglass that meets this requirement is often labeled as UV400 – the Royal Hot sunglasses My Small Store sells are Polarized and UV400 grade, not the common cheaper 380nm. Try our polarized aviator sunglasses with UV400 with cheaper models - huge difference. Warning: Even UV400 rated sunglasses are not meant to look directly to the sun. Where to get your next sunglasses? There are many outlets such as Sunglass Hut, who sells branded shades with prices ranging from $50 on sale to $600+ for beautiful Dior Sunglasses. Calvin Klein, an American Fashion Designer. My Small Store does not sell any brand like Ray Ban Sunglasses, Prada, Maui Jim, Michael Kors, Miu Miu, Tori Burch, Kate Spade New York, Oakley, Gucci and others, first we think these are way overpriced and have so many counterfeit copies that it no longer means anything. We prefer to focus on affordable brands that provide a high level of UV protection while being extremely fashionable – just look at Men Sunglasses by Royal Hot who is starting to design shades for women as well. We honestly think that Designers come up with their own names – seriously! Classic aviator sunglasses also call pilot have a dark metal frame and reflective or smoke lenses. Brow Bar shades have hit the mainstream. The addition of a second brow bar that rides along your eyebrows adds a fun addition to any look. Want more? Nah, the most important is that you love the style you pick that fits your face and your clothing style. What is important is to make sure your eyes are protected so, let look at sunglasses protection again. Remember we should wear sunglasses for protection not just fashion. Both anti-reflective coating and polarized sunglasses cut reflection glare. Polarized lenses are very effective water and snow reflection but also while driving. Anti-reflecting coatings reduce glare caused by light reflecting off the back surface of your sunglass lenses. UVB rays are dangerous, making sunglasses and sunscreen a must; they don't go through glass. UVC rays do not reach the Earth because our atmosphere blocks them (pfewwww). The best protection are UV400 sunglasses, they protect from the most dangerous UVB wavelength and this is true for any color your choose black, blue, red and even white transparent. Remember sun damage in your eyes is irreversible meaning that even if the sun doesn’t bother you, wear sunglasses – we sell some, low price and free shipping (just saying). Sunglasses for kids – oops, we do not sell those – why? Because we recommend talking to a pediatrician first because your children eyes are very sensitive, you need you make sure you get the best protection adapted to your child – are we right? I know we are. Well a long article to discuss about men sunglasses as well as women shades. Lots of information but if you have any question, feel free to contact us. Don't forget that our shop is free shipping, 30 days returns, full specs published so it makes your shopping easy.